Okay, I didn’t get this idea myself. It came from a guy named Steven; who goes by the Digg name sjbdallas. I was on Digg doing my ‘Digg stuff’ and came across a story from cracked.com titled, 6 Signs Your About to be Attacked by Zombies. In the comments, someone remarked “We also need “6 signs you’re about to turn into a zombie”. You start to notice that some people not only have good taste… but taste good too. It takes you ten times longer to walk to the mailbox. People avoid or run from you. You start to develop a pronounced dragging on one side of your body. You start hanging out at the mall with groups of strangers. Your deodorant doesn’t work anymore. You have nightmares about shotguns. You order steak rare… like in still moving. You think George A. Romero does documentaries. You doctor diagnosed you with onset Rigor Mortis. So if you notice any of these signs in yourself or someone else, run! Happy Halloween! hmmmm, I’m having a sudden craving for…. brrrrraaaaaiiiiinnnnnssss!!!! I know it’s one of my favorite things about October – the horror movies… and I like zombie movies too! LOL these are hilarious and will come in handy next week! The last Zombie movie I saw was World War Z and it was actually pretty good! I want to see World War Z! Thanks Donna for sharing these. My fave is that it takes you longer to get to the mailbox! Hilarious! LOL. Super cute post! Are you watching walking dead? I’m an avid viewer. I can’t wait to see who in the tribe will become zombified next! Yes! Love Walking Dead! I know, I’m always dreading one of my faves is going to turn or get killed. Cute! Don’t forget: if you see people “prepping” around you, that might be a sign as well! This post comes right on time with Halloween :). My daughter told me my grandson likes the Walking Dead. Now he goes around shooting zombies, lol. This was fun to read, thanks for sharing it with us and cool pic girlfriend! Hope you’re having a great weekend! 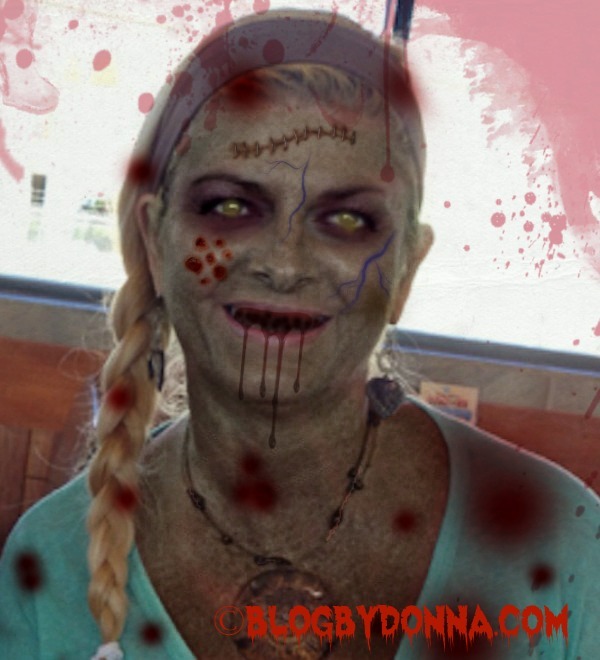 Cori, I am a little zombie obsessed. We love Walking Dead, and I love zombie movies. 🙂 I did have a great and busy weekend! I hope yours was wonderful as well! lol! Awesome list! I think #7 confirms my teen boy is turning into a zombie! Oh wait, he’s just a smelly teen! Oops – I mean #6 – the deodorant doesn’t work anymore! Maybe I’m turning into a zombie since my brain couldn’t recall the correct number! LOL! It could very well be, although my memory has been horrible for several years now, and I haven’t turned into a zombie…. yet!